Of all the rooms in your home, your kitchen is the one that poses perhaps the largest threat to your safety. After all, with all of the intense heat present in your kitchen every day, there’s a regular and high chance that some sort of calamity can occur. Of course, you don’t have to be a sitting duck and hope that no disasters occur because of the heat and other dangers present every day in your kitchen. Rather, you can take certain precautions to keep your kitchen as safe as can be. How Can I Make My Kitchen Safe? A great way to keep your kitchen safe is to help to make it as resistant to fires and heat damage as can be. And an all-encompassing means of accomplishing this is to install marble countertops. Marble countertops can help beat the heat and the heat’s damaging effects in your kitchen thanks to their heat resistant design. Indeed, with all of the cooking, frying, boiling, and all other hot cooking techniques you’ll employ in your kitchen, it’s important to ensure that the surfaces that won’t be susceptible to combustion or other heat-related damages. With marble countertops from a reliable tile and marble company, you can safely place even the hottest pots and pans upon them without damaging your countertops or, worse, starting a fire! Of course, anything — especially anything safe — should be made to last. After all, who wants to replace their kitchen additions every few years? No one! And with marble countertops, you certainly won’t have to worry about regular replacements. Being a natural and hardy material, marble can look and function like brand new for many, many years to come, keeping your kitchen safe and your bank account intact all the while. If marble countertops sound like just the thing to keep your kitchen safe and beautiful for many years, then you need to buy your marble from an experienced vendor. 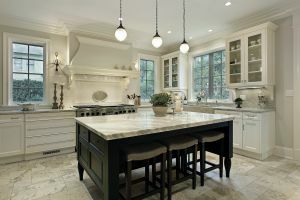 And if you live in or about the Jersey City area, then that vendor should be none other than Kennedy Tile & Marble Inc.
We at Kennedy Tile & Marble Inc. have sold quality tile to businesses and residents since 1985, meaning we have the reliability and experience to supply you with the best marble material for your kitchen!